Burn’s Corner was located at the intersection of Lake Road and Old Lake Road, at the east end of The Strip. This sign is located at N41 51.676 W80 56.639. Burn’s Corner was located at the intersection of Old Lake Road and Lake Road, at the east end of The Strip. 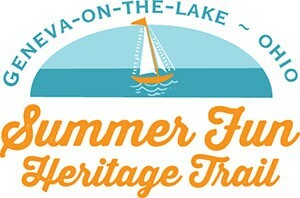 It was operating in 1950 but disappeared by the early 1960s. Owned by John and June Burns, the restaurant was one of several sandwich shops on The Strip that offered “fast food,” such as sandwiches and French fries. He was one heck of a salesman and would do anything to make a dollar. Burns had a hard childhood and adolescence; he went to work at the age of 14 washing dishes and worked as a carnival ride/game operator. 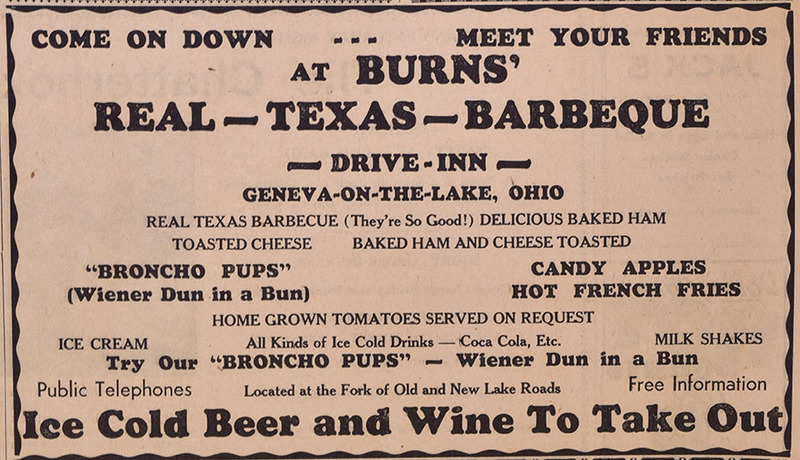 Burns’ ad from The Beachcomber, 1947. 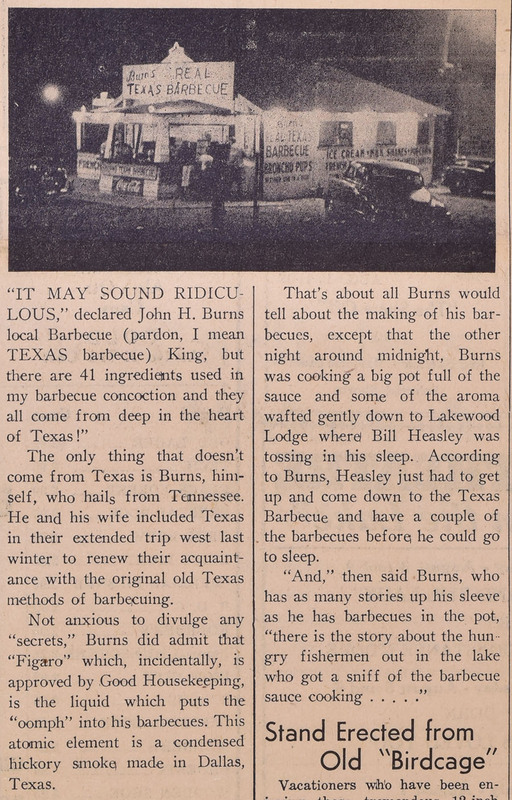 This couple also ran a market, Burns’ Super Market, across from the barbecue stand, where “Survivors” bar used to be. The store was known as Seaman’s Grocery Store prior to Burns’ purchase. It also was a Laundromat. 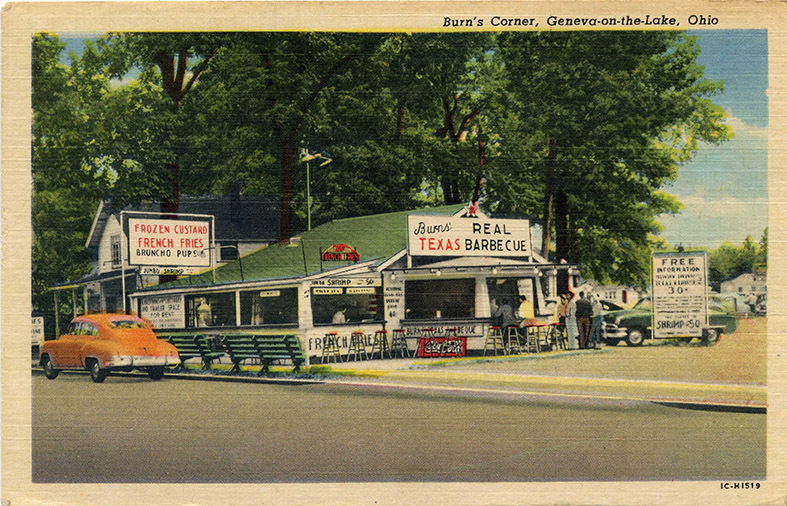 A photo of Burns’ stand, taken in 1947 for a Beachcomber story, shows an establishment much different from the cleaned up version in the postcard. 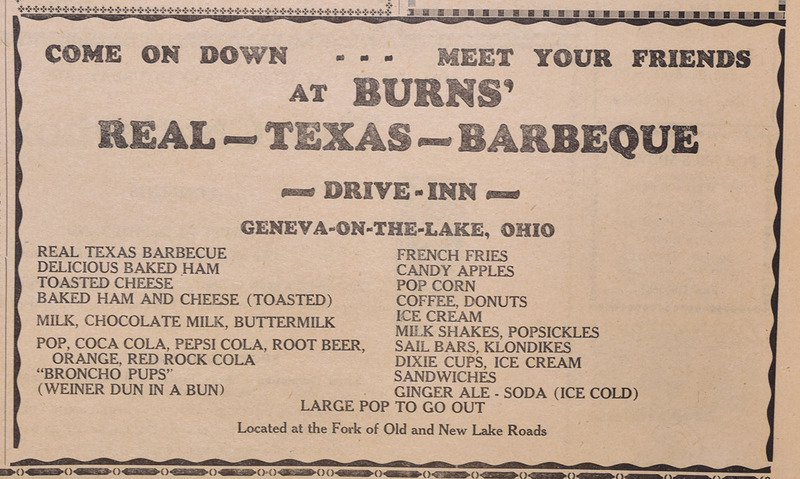 Advertisement for Burn’s Market taken from the souvenir folder for the Sands Beach Motel, circa 1960. Peter Bozell of Cleveland purchased Burn’s in 1955. Mary’s Kitchen continues to use Burn’s Texas Barbecue’s recipe for its sandwich.